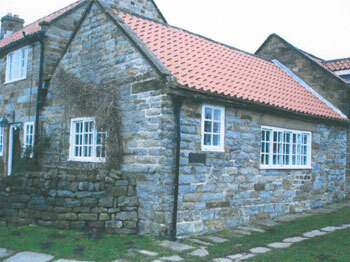 These are one of only two Grade II* Listed Buildings in the village of Goathland. 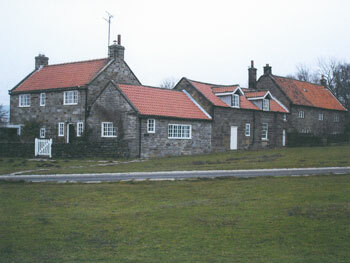 These were formally a farmhouse and outbuildings dating back to 1740 having been rebuilt from an earlier house by John and Elizabeth Cockerill. The properties were altered in 1851 by John and Mary Scarth before being sub divided in the early 20th century to form the existing house and cottage. The House is a fine example of a cruck-framed Yorkshire longhouse encased in dressed sandstone with a pantile roof. Brereton House is two storeys with a three window front and has a right-of-centre board door in a quoined and chamfered doorway with a heavy lintel inscribed; CIE 1740. The windows to the right of the door and on the first floor are of three mullioned lights with large pane casements. There is a Cavetto-moulded eaves course with coped gables and shaped kneelers. There is an external end cornice stack to Brereton House. To the rear the roof slopes to the first floor even though it is of two storeys on this side consisting of three bays with one storey outshuts added to the end bays which have later doorways and blocked windows in stoned surrounds in the return walls. The centre bay has a partly blocked five-light mullioned window to the ground floor. The right return has two light chamfered mullioned windows on the ground and first floor to the right of the external stack. The first floor rooms on this elevation have skylights for windows. To the interior there are plank cross-passage doors and the left end room has an Inglenook fireplace with a plank and muntin heck and stone bench with chamfered square-section joists. There is a witch post (sadly the carved decoration was destroyed by woodworm) next to the bench. There is also plank and muntin partition walls between this room and the outshut and the centre room. On the first floor plank and muntin partitioning forms passage and staircase walls and several fielded-panelled doors survived throughout the house including one in the left hand bedroom on butterfly hinges. The attic door hangs on butterfly hinges and there are two attic rooms both with skylights. In Brereton House two pairs of crossed-apex upper crucks resting on ties survive and one pair survive in Brereton Cottage. The original cross-passage doorway is still in existence in Brereton Cottage with a quoined and chamfered surround and lintel carved in a shallow triangular arch. There is a tiny four pane sash above with a stone sill initialled and dated IMS 1851. There is an inserted board door at the far left beneath a hammered lintel with a six pane casement to the right and the remaining ground floor window is a sixteen-pane sash with a tooled sill and hammered lintel. The first floor consists of two-light gable dormers with twelve pane horizontal sliding sashes each. There is a coped left gable and block kneeler and a ridge stack towards the right end. The two storey part of this property was built in 1925 using the stone from various substantial outhouses of the original Brereton Farm which was demolished in the paved area at the rear of the farm. The single storey adjacent to this, which is the large lounge to the property, was part of the byre of the original Brereton House. The two storey section is of three windows with small-pane casements and horizontal sliding sashes on both floors all with painted timber sills. The gable wall has three-light, eighteen pane horizontal sliding sashes beneath tooled lintels. 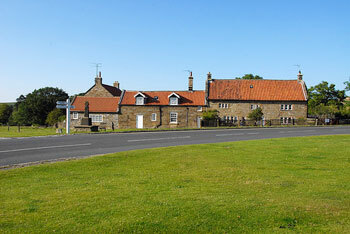 Brereton Corner was commissioned by Dr J B Morrell and designed by York Architects, Brierleys and all three properties were purchased by the Trust in 2006 from his grandson Nicholas Morrell, one of the existing Trustees.